2014 Baseball Schedule Magnets – 5 Reasons Why You Should Grab Them? Vast Body of Options – Precisely there are 162 baseball games being played per season. This means you have 162 chances for enticing baseball fans to your business. This means there are vast chances to exploit craze for the sport and convert them into leads through any of these baseball schedule magnets. Sports Acts as a Great Relationship Builder – It is true that sports acts as a great relationship builder. Sports fans are fiercely loyal about their favorite teams and they can go to any extremities for defending their pride. 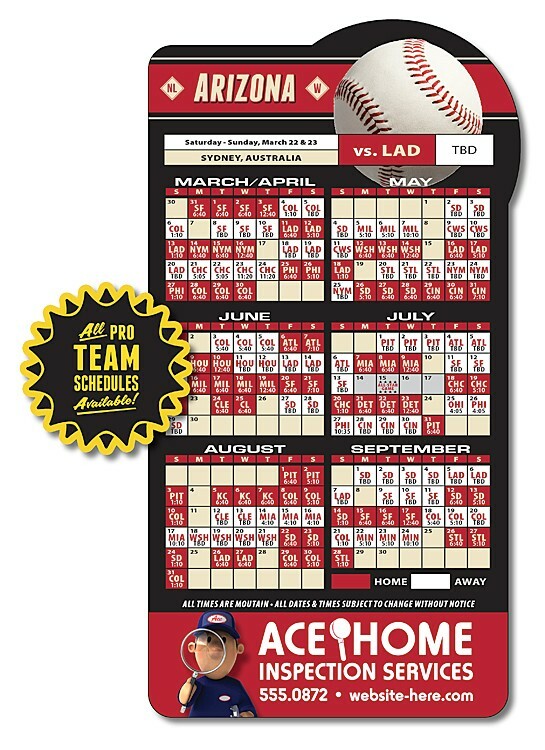 If you are struggling hard to attract customers in different demographics, then we suggest you go with any preferred pro baseball team schedule magnets. It will not only bring you closer to untapped customer segment, but also help you to influence their branding decisions. They would be happier to retain the information that you provide and would think highly of you whenever they look at schedule information of their favorite team. Receive Wide Exposure – Can you neglect American sentiment towards baseball? Never because love for this sport is deeply rooted in their consciousness. A baseball is for American what cricket is for most Commonwealth citizens. This means these baseball schedule magnets are going to be the big thing, when the season is in progress. Sports fanatics are fiercely loyal about plastering information about their favored team performance schedules at all visible places such as business inventory stocking areas, work, on home refrigerators or restaurants and taverns. And by doing so they try to stir emotions of fellow supporters. If your business information is imprinted on each of these magnets, then imagine how easily you will get popular. This is why sports schedule advertising is being largely preferred for value building by small and large budget marketers alike. Grab Large Market Share – For a newbie on this page – a market share is a term, which depicts percentage of sales that you control in your niche market. By tapping a sports fanatic’s consciousness you are actually trying to get popular with minimum efforts. This type of market penetration easily aids you to grab large market share by evenly slicing the competition in your favor. Easy Distribution Channels – Unlike the regular promotional magnets that are mostly handed out during business events, these sports schedule magnets (although they bear business information) can be gifted on any occasion, where you feel it is appropriate to acknowledge a sports fanatic. You can gift them at local baseball games, professional baseball events, at sporting good stores, at concession stands and many more. So get ready to roll the competition by investing in 2014 baseball schedule magnets!